What is a man? A miserable pile of sprite edits? But enough talk! Here’s what’s in the Halloween update. Capcom: Blanka, Demitri, Felicia, Gallon/J.Talbain, Pyron. Also: Morrigan gets a new sprite! Game Index – New “Other version” and “Port of” parameters added to system. If the game is a port of another game, it lists that game and links to it if it’s in the index. If the game has other versions, it will list the alternate versions and link to them if they’re in the index. Sprites – More sprites and animations added to Castlevania:SOTN section. 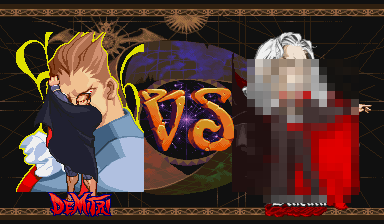 Sprite Edits – Konami gets it’s own page with two Dracula sprite edits, one Succubus and a made-from-scratch Alucard sprite. Yes, Alucard! Finally! Altered Beast wolf form added to Sega page and Rick from Splatterhouse was added to the Namco section on the “Game Related” page. Logos – Castlevania Chronicles, Castlevania SOTN (full size), and animated Golden Axe logos added. Mini Logos – Alucard, Blanka, Demitri, Dracula, Mars People, Rick Taylor, Sonic, Simon Belmont, Succubus, Tyris Flare (GA1 style) added. Okay, that was more talk. I’m sorry. Enjoy the update and have a Happy, safe Halloween! Comments Off on What is a man? A miserable pile of sprite edits? See, that’s what I’m I’m talkin’ about. 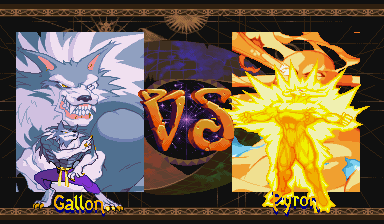 The Darkstalkers face off against monsters and monster-fighters from a few side-scrolling classics in an all-monster update for the Vs. Maker and it all goes down this Saturday. Game Index, Company Index – Castlevania:SOTN was added. There isn’t much there except for links to other ScrollBoss material and some new ePSXe-made screenshots. The game and a few new character listings (but no S-Files) were added to Konami’s company index page here. Sprites – A few more Castlevania:SOTN sprites were sprinkled onto the Castlevania page. Many other sites have this game very well covered but it’d still be a shame to not have a small gallery here. Logo – Added a thinner version of the SOTN logo. Plus, a new SOTN pagetop graphic was added to the main menu. You’ll still get the older ones randomly but you’ll probably get this one until Halloween is over. Then it will just be on regular random rotation. I’ll try to get some more horror-related things together for a near-Halloween update.